Just now while I was pouring my coffee I began reading Dear Abby. Was that ever a mistake! 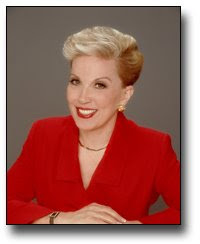 Has anyone else noticed how trashy Dear Abby is getting? The other day a guy wrote in about how his shacked-up honey, to use Dr. Laura's term, didn't jump up on his lap any more when they watched TV together. I saw that letter with my own eyes. Plus, the guy's girlfriend was "Brandy." That is a trashy name. Today there is this letter from parents telling the world that their 14-year-old daughter is bisexual and they are squabbling over how that affects who gets invited to her sleepovers. The mother says -- oh, I can't write it. It's all too down-in-the-alley. If you think I am making this up you can read it here but I do not suggest it. As I have confessed before, I am a little too in touch with my inner Victorian. But I do not think matters like this should be discussed in the public square. And if Dear Abby has to print a letter like that, I think she should at least suggest to the parents that maybe 14 is a little young for you to be, uh, so in touch with your own sexuality, you know? Dear Abby used to be classy. Once someone wrote a letter to Dear Abby about Leonard Pennario. I found that while I was working on my book. It was in the late 1960s. The letter writer referred to "Horowitz, Rubinstein and Pennario." Pennario did not see what the big deal was about that letter. But I loved it, because it so eloquently illustrated his cachet. And my sister Katie was impressed by it, too. Now that I think of it that has been the only thing that has ever impressed my sister about Pennario. Nothing else registered with her. 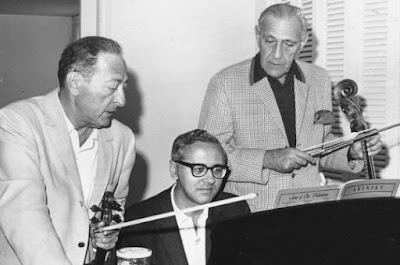 Not that Pennario was the preferred pianist of the violinist Jascha Heifetz (that is Pennario -- love those glasses -- pictured up above with Heifetz and the cellist Gregor Piatigorsky). Not that Pennario learned and memorized the Grieg Concerto in a week when he was 12. Nothing. But I mentioned Dear Abby and that put him over the top in her mind. Today Dear Abby is quite different. I would not want Pennario in there now! Thats ok. While The Wife was in San Diego, I was in a hot tub with Dear Abby! Howard! Oh Dear Howard! I'm sitting in the local coffee bar (3 Bzzz) ROTFLMAO. Love your humor. Mary! As always a treat to read your work. Do you need any readers to read the manuscript before the big publishing? More than happy to do this for you. You're awesome, Howard! Happy Hannukah!